Saul Walker, the founder of API Audio in the late sixties, was one of the true pioneers of world-class, game-changing audio equipment production and extremely deserved of the much overused title 'Legend' for his unique, innovative ideas. It was the invention of the 2520 op-amp that made API the audio legend it is today. This little amplifier is still in use today, in all of API's designs, and it is what makes them one of the most sought after sounds in audio recording around the world. Dozens and dozens of classic albums have been recorded through API boards and outboard, and API are still one of the few true large format console designers today from their 1608 up to the new Legacy AXS console. Their classic range of outboard includes the studio must-haves the 2500 Compressor 3124+ 4 Channel Mic Pre (can you record drums without one?) and the relatively recent 5500 stereo EQ. 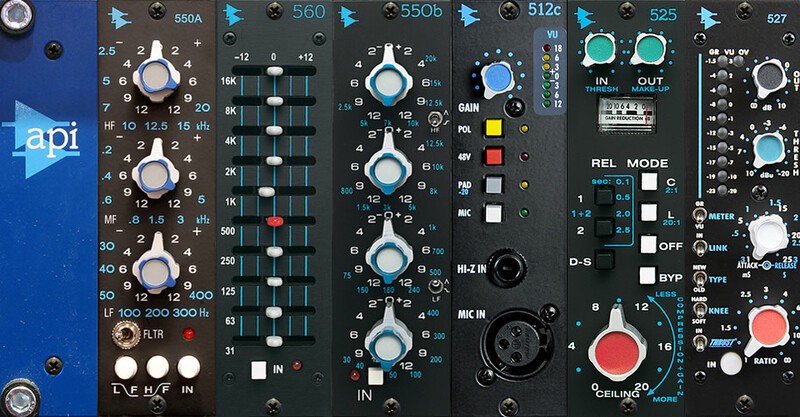 API also pioneered the modular format, and this is where the 500 Series format originated from, starting with their 512c mic-pre, 550A EQ and 525 compressor. KMR Audio has a long and proud history with API. A true legend of audio recording. Nothing is like an API.